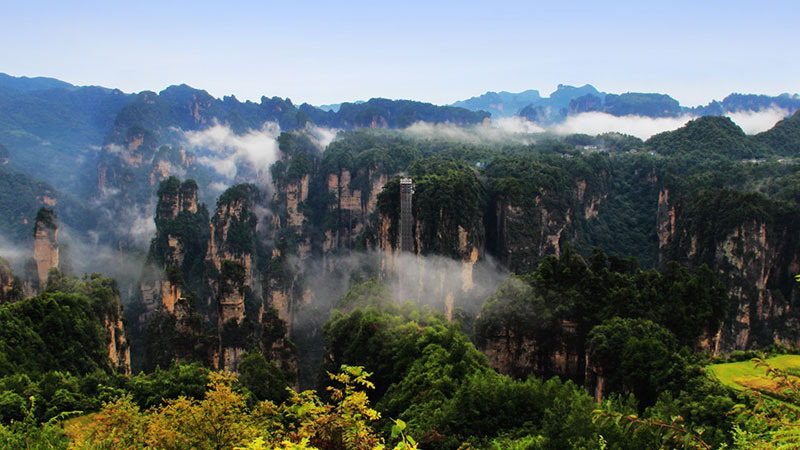 Zhangjiajie National Forest Park, visit Golden Whip Stream, located in eastern part of the park, Golden Whip Stream was named after Golden Whip Rock, With dense forest, clean water, beautiful flower and grotesque peaks, Golden Whip Stream is a quiet and mysterious gorge. It was praised as the most beautiful gorge in the world. 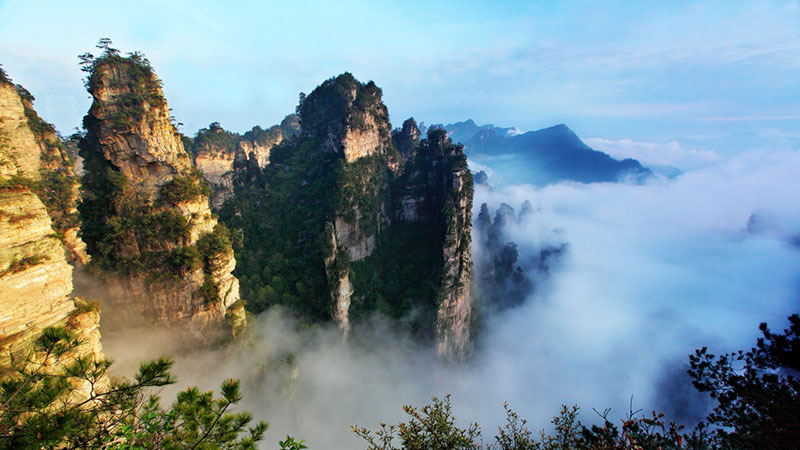 In the afternoon, climb to the Yuanjiajie, also called AVATAR Mountain for the movie AVATAR filmed here 3 years ago,enjoy Hallelujah Mountain,NO,1 Bridge in the world and so on. 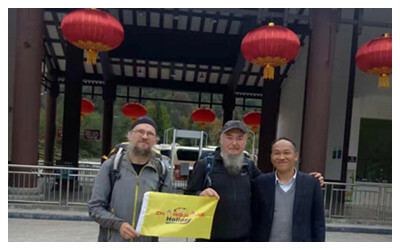 You need to get up early,A full day sightseeing starts with Grand Sightseeing Platform --a famous place for seeing the sunrise ,it only takes 10 minutes from your stay hotel to it. 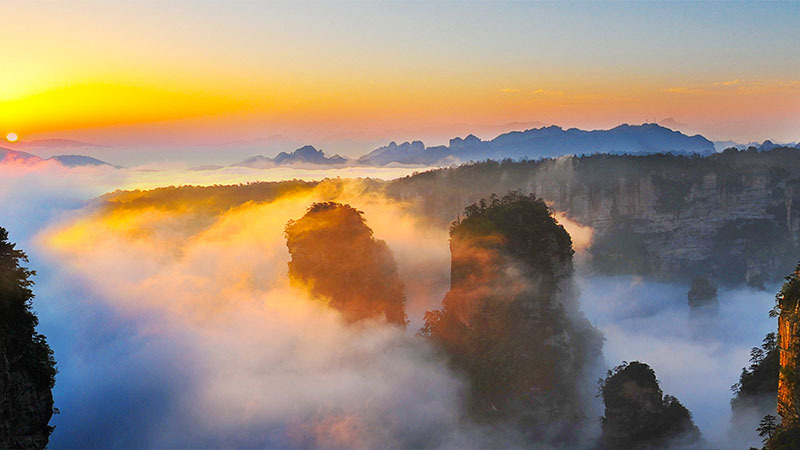 Sunrise in Grand Sightseeing Platform is one of the 4 natural wonders in Zhangjiajie National Forest Park.Visit Tianzi Mountain, Tianzi Mountain is a mesa in the northwest of Wulingyuan. Up on the mesa, the field of vision is widely opened up and it is a perfect location to have a panoramic view of the nature reserve,visit Helong Park, The West Sea and so on. See you off in Zhangjiajie Airport, see you next time.